DETECTO's USA-made HealthySole® is an effective and groundbreaking use of UVC technology that eliminates the dangerous organisms that cause healthcare-associated infections (HAI’s). DETECTO’s HealthySole® is the only clinically-tested UVC germicidal light system to kill and eliminate up to 99.9% of exposed disease causing organisms on the soles of shoes. DETECTO's USA-made HealthySole® is an effective and groundbreaking use of UVC technology that eliminates the dangerous organisms that cause healthcare-associated infections (HAI’s). 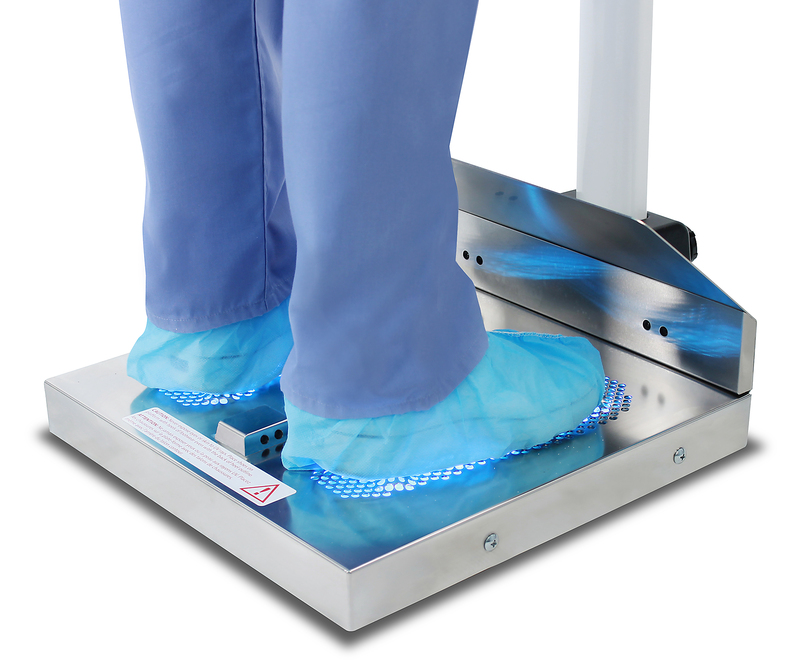 By introducing the patented HealthySole® into an existing infection control and prevention program, a healthcare facility adds a significant active layer of defense, that once implemented, reduces the rate of airborne, horizontal and cross contamination and does not incur additional labor costs. HealthySole® works efficiently in only 8 seconds disinfection time and offers completely hands-free operation via the 8-second countdown timer on the full-color, eye-level display. The nearly-flat, 2.4-inch-high low-profile stainless steel platform measures 17.2 in W x 21 in D. The product's design is patented and patent-pending in the US and worldwide. Lowering the overall microbial burden in a healthcare facility leads to a decrease of HAIs. Facilities who have positive performance standards by lowering HAI’s, will reduce the additional treatment cost that is otherwise passed to them, shorten extended length of stay for patients, and save more lives. DETECTO’s HealthySole® is the only clinically-tested UVC germicidal light system to kill and eliminate up to 99.9% of exposed disease causing organisms on the soles of shoes. Germs such as C. diff, MRSA, Staph, and VRE are all transported on the soles of shoes, transmitted to the floor, and aerosolized from air currents, ventilation, and human and equipment movement. These pathogens then land on patients and equipment, they are inhaled, or redeposited back on the floor in a migration cycle for the organisms that costs hospitals $28-45 billion per year in additional patient care. HealthySole® is green technology that does not require the use of disinfectants with harmful chemicals. HealthySole® UVC lamps utilize patented plasma stable and Plastic Encapsulation Technology™, making them shatter resistant, self-cleaning, and ETL listed. HealthySole® assembles easily in just a few seconds without using any tools and includes an AC power cord. Independent third-party clinical laboratory test results are available on DETECTO's Web site (http://www.detecto.com) showing the high efficacy and kill rates in just 8 seconds for the device. HealthySole® is ETL, CETL, and CE listed.